Above Photograph: Tinker earning a gold medal for weight pulling at just under two years of age. This page has quite a bit of information on weightpull and the Alaskan Malamute, weight pull events, training required, the dogs working wins, and various working events we attend - and of course, many, many pictures of my Alaskan Malamutes pulling weight at both snow weight pulls and dirt weight pulls. I've only done one indoor weight pull and it wasn't as much fun as 'out in the elements' plus the dogs can pull a lot more than they would, naturally. Every dog I currently own, has won several 'gold medals' (first place) for pulling. Bert and Ernie have won entire weight pull events - with more than 50 dogs, mainly Alaskan Malamutes, competing. The ladies have both been 'number two overall' (second best weight puller of the day) a few times and Ms Ook finally had a 'top pull' Fall 2011! There really isn't an age that the dog is too young, or too old, to do weightpull or other working events. It does take lots and lots of extra work if you don't start the dog as a puppy on various commands, the equipment. But the weight itself, can be held off until the dog is more than a year of age. Obviously, you don't put heavy loads on a young dog. But you can certainly put a harness on them and have them drag a pop bottle or something little and light weight. It will help with sound sensitivity should there be any, if nothing else. A sound sensitive dog is worthless, sledding or in weight pull - and actually pretty dangerous. If you are started a young dog out, getting them into a harness, as early as possible is one of the best things for the dog. On the other hand, if there is any fear or concern of any hip dysplasia in the lines or puppy, DO NOT weight pull - or even do any form of working with the dog - until the hips are checked. Weight pull, sledding, strenuous exercise and a dysplastic dog DO NOT mix well. While exercise has not proven to cause hip dysplasia (and the subject has been studied extensively) it absolutely aggravates any hip dysplasia that is already there - minor to moderate, for example. That has been proven in many, many studies. Over eating, growing too quickly, and excessive jumping will also aggravate dysplasia. Hip Dysplasia is born, not made. Some breeders go to such extremes to prevent exercising dogs that they write into the contracts not to do anything at all with the dog prior to two years of age or the contract is void. By then, it's frequently too late to train for most activities. Personally, I would have serious concerns in buying a 'working' breed who wasn't allowed to work. If the parents you bought your dog from, did NOT have its hips checked, assume there could be a problem with your puppy, and DO NOT take the chance until you can have the puppy's hips certified. Yukonjaks Ernie - a great little weightpull Alaskan Malamute! Ernie has won so many weight pulls I can't remember them all. His most notable Alaskan Malamute weight pull win was 'grand little Alaskan Malamute pull dog' of Pack and Pull. Pack and Pull was a weight pull sponsored by Alaskan Malamute HELP League to benefit rescue Alaskan Malmutes. He has about 10 weight pull event 'top' wins (where he had top pull over every dog at the weight pull plus a gold win for his weight pull class) and another five or six golds and silver wins for at least his weight pull class. Ernie is nearly nine and usually does around 800 - 1000 pounds these days. Not bad for a 'senior Alaskan Malamute'! His top weight pulled was around 1500 pounds and he weighed between 97 and 103 pounds in his younger days. As he ages his body weight is decreasing since he really isn't being worked very hard. Ernie was never trained for weight pull and simply did what he was asked, as Ernie always has, with astounding results. My other Alaskan Malamutes have required weightpull training, but not Ernie! Ernie has enough wins for his Working Weight Pull Dog Certificate (WWPD) but I'm waiting until I do a few other things with the dogs to actually send in the paperwork. At Ontario Dog Sports there are quite a few pictures of my Alaskan Malamutes, Bert and Ernie, at a snow pull, I assume as the examples for the sport as I was never asked about the pictures and found the photos by accident. a late bloomer at weight pull! Ooky has only done a few competition weightpull events - maybe five? She has mostly gold and silver wins for when she's been entered at an event. While she is around 85 pounds in weight, her top weight pulled is around 960 pounds. She has only been doing weight pull since 2010, though she was entered in one as a young Alaskan Malamute. Unfortunately, all the conformation showing meant she had to be kept pretty clean and as you can see below, that's not easily accomplished in the dirt, mud, snow, ice and various other things she can find to roll around in at a weight pull competition! I have some neat pictures of Ooky when she's done a weight pull as she is quite animated. Slushpuppy's Special Sleigher - who needs lots of training for weightpull! And the newest Alaskan Malamute of them all, Tinker, was competing in competition just after one year of age. She has quite a few great weightpull Malamutes behind her from her grandfather, Cascade's Sabre Bear. She loved the snow weight pulls (taking gold for her classes) and came in second dog overall, behind her 'great uncle Ernie' - wow! She did not like the dirt weightpull though and some Alaskan Malamutes do favor snow over dirt, or dirt over snow. She will get lots more chances! Bert was just begining his 'weight pull' competition career, when he had an accident and hurt his leg. It is unlikely he will ever do any serious form of excersise again. Tinker jumped on his leg in the kennel one day and severely damaged his cruciate ligament, a known problem with Alaskan Malamutes. Bert's top competition weights were around 2000 pounds, with him weighing around 130 - 140 pounds, but he required some training. 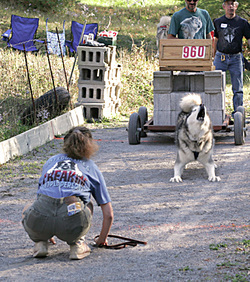 His first pull was an IWPA weight pull and mostly Alaskan Malamutes were at this competition event. While he could pull the weights, he is extremely sound sensitve and had to be desensitized to just about all sounds. He, too, was 'grand little pull dog' at the Alaskan Malamute HELP League Pack and Pull competition event one year, the last year they ran the 'fun event' and subsequently he won several more 'top pulls' at other events. Sadly it was the last weight pull held by the Alaskan Malamute HELP league and so we've never done another there. Bert has about five gold medals and several silvers from his wegiht pull adventures. At Ontario Dog Sports there are quite a few pictures of Bert and Ernie at a snow pull competition event, I assume as the examples for the sport as I was never asked about the pictures.